KCPS is pleased to announce “Through the Photographer’s Eye” – an exhibition of images created by its members. Starting on Monday 17th September with a members and guests only opening evening, the exhibition is open to the public from 18th September to 5th October inclusive. KCPS 1st Meeting for the YEAR. An early reminder that our first meeting of the year will be on Monday 13 February – a general catch-up for us all, planning for the year’s events, and a surprise item the committee are planning. The brochure for the year will be available at that meeting. Top of the agenda right now, however, is putting together two sets of images taken on the south Wairarapa coast by our members. These are to enter in the Wiltshire Cup (four digital images) and the Bledisloe Cup (four prints, subjects must be taken in NZ). A selection subcommittee will decide on the final sets. Once we know which images are chosen for the prints we will ask for larger high-resolution files to print from. Some images may come from last year’s field trip but others are welcome. Please email your images in the size you would submit for club salons: max 1080 ppi on the vertical side, max 1620 pip on the horizontal side, SRGb and JPG. Your images can be of landscapes, buildings, people, activities, seascapes, even abstracts… we’d like lots to choose from. They need not have been in a club salon beforehand. Everything you send will be deleted from the computer once decisions have been made. The deadline to receive these images is Friday 27 January. Send to aviskovic@paradise.net.nz. Entries are open to any New Zealander and PSNZ member residing overseas. In a change from previous years registration and submission of entries will open on 1 December 2016 and will close on 10th February 2017. The selection process will be conducted over the weekend of 25 February, 2017. Enter here http://www.photographyontheedge.org/ and click on the ‘Salon’ tab for details and Entry Form. The PSNZ New Zealand International Salon is open for your entries and will close on the 20th February 2017. Heaps of awards to be won including 12 Gold Medals. NZ$4.50 per image. up to 4 images in each section. The Auckland Photographic Society is pleased to announce that registration for the 65th PSNZ National Convention – Photography on the Edge. Being held at the Waipuna Hotel and Conference Centre, from 6 – 9 April 2017, this will be an exciting opportunity for everyone to learn from the best, experience the enthusiasm of passionate photographers and to interact socially with other members and friends from throughout New Zealand. If you have never been to a PSNZ national convention before, put an ‘I need to be here’ action on your calendar. Register now for the ‘early bird’ discount and ensure you don’t miss out on your preferred choice of workshop and field trip. The timing of the field trips will allow delegates to attend one in the morning, be returned to the hotel, and to then attend an afternoon session. Read the instructions carefully and follow the easy steps to register. There is an outstanding lineup of talented photographers, speakers and presenters, as well as a great support from sponsors and trade stands – you will definitely be spoilt for choice. The club exhibition opening night was a huge success, officially opened by Deputy Mayor Mike Cardiff and followed by amazing selection of drinks and nibbles provided by our members. Everyone enjoyed the array of images, the display of diversity and massive talent our club has to offer. A special thank you to our president Alison for all the work she did in preparing the images to the highest standard and ensuring the exhibition flowed cohesively. If you haven’t been yet? the exhibition is still on until the Friday 24th June. Another of our KCPS members, Helena Fierlinger, has an exhibition on at the Mahara Gallery in Waikane from 29 August to 27 September. Her photographic exhibition is entitled “Natural Design”. Click below for further details of the upcoming Mahara Gallery exhibitions, and a floor talk by Helena at 11 am on 16 September. KCPS member Hal Gimpelson will have a second solo show in the Art Space at the Paraparaumu Library from 23 August through 11 September. 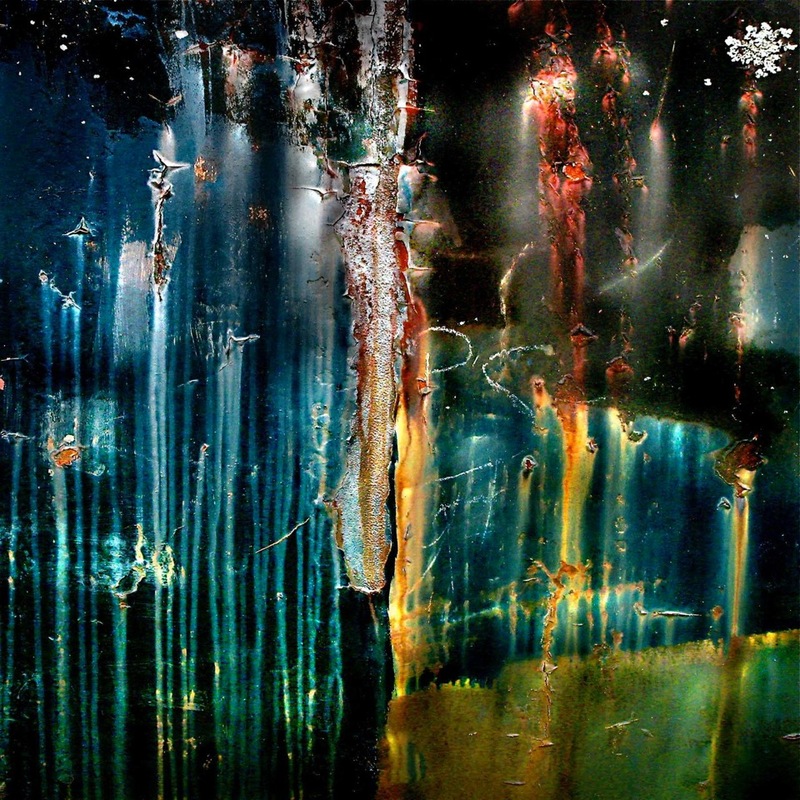 It includes 15 abstract close-ups of rust and graffiti on railroad cars and prints of sunsets. Some of these images have been seen at KCPS meetings but have been refined. Some of the sunsets are now printed about 1.5 metres wide. To whet your appetites, below are a couple of the images on show. For poetry readers, three of Hal‘s writings have also been selected by three artists to create new works. It’s a fascinating show combining writer and visual art at an annual show entitled Con-Fluent at the Emerging Light Gallery in Plimmerton from now (it started on 14 August) to late September. A metal piece by eco-jeweller JoAnna Mere is entitled Exhale/Poumoana with words from Hal’s Never Stopping, a felting work by Birgit Moffatt based on his Carving Aotearoa, and a third piece composed of layered and carved photos based on his We Can’t Photograph Every Cloud.